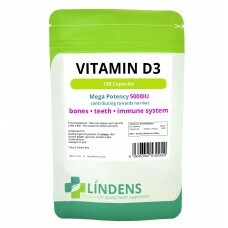 Each capsule contains 5000iu (125mcg) Vitamin D3 which is 2500% of EC Recommended Daily Allowance. This item is dispensed in our "foil-fresh" packaging. This is heat sealed for safety; once opened however the pack is re-sealable to maintain freshness. The foil pack is comprehensively labelled giving instructions for use and a full list of ingredients to meet current UK legislation. Your purchase is sent direct from our dispensary and is posted in a padded envelope that is letterbox-friendly. Take one capsule per day with food. Each capsule contains 5000iu (125 mcg) Vitamin D3 which is 2500% ECRDA. Store in a cool dry place out of reach of children. INGREDIENTS:Soya bean oil, gelatin, glycerine, purified water, cholecalciferol.